Your Place. MORE Space. Two bedroom homes with private den/office in all but corner homes, all with balconies & covered parking! LIVE LIKE YOU LIVE IN A HOTEL, WITH 50% MORE SPACE THAN OTHER AREA FLOORPLANS! Welcome home to a brand new lifestyle, where luxury and convenience blend together to create this one of a kind experience. We invite you to experience Queens Gate luxury apartments, a unique collection of oversized, all 2-bedroom residences made to feel like a home you own, and located in the heart of Bound Brook/Bridgewater, NJ in Somerset County - the wealthiest county in New Jersey. This new gated community features modern design amenities, sophisticated design, and an unparalleled convenience to major NJ highways. The 1500+ SF two-bedroom residences of Queens Gate boast 50% more living space than that of any other community in the area, as well as large private balconies with storage, dramatic 9' or 10' ceilings, designer kitchen and baths and most floorplans with dens/offices and remote-controlled natural gas fireplaces. Entertain in your gourmet kitchen with elegant maple cabinetry, oversized granite countertops with bar seating and stainless steel appliances. Relax in your luxurious bathroom with master baths featuring stand-up showers with elegant shower seats. Sound absorbent wood-like, maintenance-free vinyl flooring gives you the look of hardwood without the maintenance, as well as elegant ceramic tiling and plush carpeting and tray ceiling entry foyers fill your home with inviting comfort as well as stylish luxury. Easily manage energy efficiency with single zone high efficiency central air conditioning and heat with programmable thermostat. Expansive layouts with over-sized low-E glass windows bring gorgeous natural light into your spacious new home. Amenities include a resident-only clubhouse, a gated dog park for your pet, professionally landscaped exterior with grilling stations, multiple seating areas, fire pits with built in seating and a half court fenced in basketball court. Live peacefully in our gated community with state-of-the-art personal access control & video monitoring system, covered parking, fitness centers, decorated furnished lobbies on each of the four finished floors and community lounges in each building, all surrounded by a quiet residential neighborhood and a serene outdoor environment with babbling brook. More living space, more outdoor space, more storage, more covered parking, more privacy, more convenience, more amenities, more style ... more you! Only moments from the center of Bound Brook/Bridgewater in Somerset County, Queens Gate residents can enjoy all this suburban neighborhood has to offer: shopping, family activities, exciting nightlife and great farm-to-table restaurants, while being only being minutes away from all major NJ highways and NJ Transit train stations offering service direct to midtown Manhattan. Even closer is the grocery store and shopping center across the street from the community! Bridgewater Commons, Bridgewater Mall and walkable shopping and dining, as well as SOMERSET Patriot ballpark only minutes from your door, makes ours the ideal location! 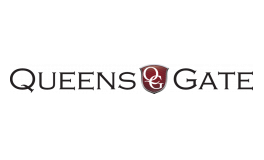 We know that you will find the home you've been looking for at Queens Gate apartments. Our onsite professional management representatives are available at your convenience to assist you with any questions.